Images from Chopper 11 HD showed a little red truck submerged in a Wendell pond near Blair Hills Road at Lake Glad Road. WENDELL, N.C. (WTVD) -- A truck ended up in cold water Friday morning after rolling into a pond. 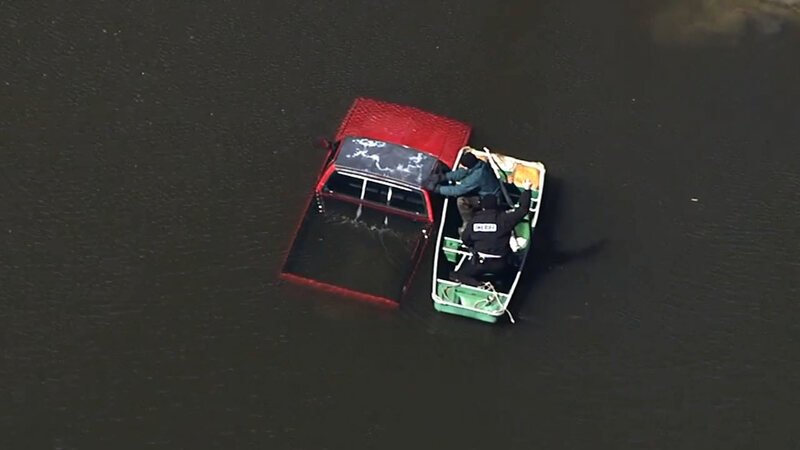 Images from Chopper 11 HD showed a little red truck submerged in a Wendell pond near Blair Hills Road at Lake Glad Road around 11 a.m. It was unclear how the pickup ended up in the water, but it appeared to belong to a nearby homeowner whose driveway backs up to the water's edge. A man was seen retrieving items from the vehicle, which still had its windshield wipers running, after boating out to it.